I, Robot (2004), holding it's own in the genre pantheon? I, Robot has a fan base that I'm glad to say has kept this film from drifting down into the depths of bad blockbuster sci-fi ratingville. I remember upon the film's release how so many people were wary of if Will Smith could carry the film? The concerns from Isaac Asimov's fans about a sacrilegious take on his legacy etc etc. Truth is is that I, Robot is an amalgamation of sci-fi ideas, from the suggestion of Asimov to the novel of the same name from Eando Binder, it's a mix that ultimately gives us a cop versus sci-fi conspiracy picture, that is sure as hell entertaining if taken on popcorn terms. Having just watched this again for the first time in a year or so, I found that it still hits the mark to me as a real tidy genre piece with a solid heart beat to keep it thought provoking. A futuristic mystery is smartly realised by Alex Proyas' directing in the manner befitting the subject, and of course Will Smith handles the entertaining action lead role with much ease. However, the main triumph (outside of the story) is Alan Tudyk as our computer generated protagonist Sonny, the voice and humanist movements are brilliantly brought to life by him and it's a real pleasure to observe. The quality of mercy is not strnen. Well, hallelujah -- a kindred spirit! I love this movie, too. Can't imagine why anyone wouldn't. Thanks for the great write-up for this enjoyable film -- and all the others you've posted about. I was worried that asking our members to start all over again with The New All Sci-Fi after the old one was killed off by it's incompetent web host -- AtFreeForums -- after seven years would be too much for them. But the new board is already up to 571 threads and 30 members. Thanks for being part of this noble effort to rise like the phoenix from the flames of etc. etc. etc. Posted: Mon Sep 29, 2014 11:11 am Post subject: Your work here is superb. You, Butch, and the gang deserve the utmost support. It's a wonderful site and I'll do what I can to get as many threads started again. I'm embarrassed that I wasn't the one that started this thread, but Spike did a masterful job of it, and I'd love to see more discussion of this flawless movie. Like, for example, does anyone want to dispute my statement that's its "flawless"? Hmmm? And I think Sonny is a magnificent robot, so radically different and appealing that he's in league of his own. A bad mix-up of the Isaac Asimov stories with almost no connection or feel of the originals. Basically a vehicle for Will Smith's 'acting'. I contend that those stories are so dated there was no way they could have been adapted for modern audiences who were already familiar with hi-tech mechanism beyond what the stories described. The stories are just too far removed from the future they predicted. Today the average person carries more advanced technology in their pocket than anything Asimov imagined. It's not his fault. He knew great things would happen. And they did. But no one could have foreseen how complex and wondrous the world of robotics, computers, and A.I. would become. The movie wasn't made for people like us, who grew up wondering if technological miracles would someday become real. It was made for people who grew up in a world where a person can hold a device in one hand and browse through terabytes of data just for the fun of it — while talking to a friend and sending them the data and pictures they found online. Forget the stories. Enjoy this great movie (with very fine acting) for it's own sake. The movie was made from a script that had been floating around Hollywood for nine years. The studio owned the rights to the stories, and figured that they could sucker Asimov, and S.F. fans in by grafting names and terms from Asimov's stories into the script. It didn't work. I respect the fact that Asimov purest didn't like it (for reasons that elude me), but it did in fact "sucker S.F. fans in" — like me and many of the film critics, too. The final script retained some of Asimov's characters and ideas, though the ideas retained were heavily adapted and the central plot of the film is almost entirely original. Richard Roeper gave it a positive review, calling it "a slick, consistently entertaining thrill ride". The Urban Cinefile Critics call it "the meanest, meatiest, coolest, most engaging and exciting science fiction movie in a long time". Kim Newman from Empire said, "This summer picture has a brain as well as muscles." A Washington Post critic, Desson Thomas, said, "for the most part, this is thrilling fun." Many critics, including the IGN Movie critics thought it was a smart action film, saying, "I, Robot is the summer's best action movie so far. It proves that you don't necessarily need to detach your brain in order to walk into a big budget summer blockbuster." I don't think anyone could have made a modern movie (aka not a retro-nostalgia piece) by combining Asimov's short story collection from 1950. The dramatic changes in our society and the startling advances in the technology which the stories attempted to predict are just too great. The premise of a robot uprising and of robots acting collectively as a direct threat of humanity appears nowhere in Asimov's writings, and indeed Asimov stated explicitly that his robot stories were written as a direct antithesis to this idea. And yet, robotic mechanisms in real life have replaced many manual labor positions, and computers now do so much of our routine thinking for us. People are understandably concerned by the fact that robots are getting better at what we do — while we, however, are not. This growing concern makes Asimov's predictions seem sadly outdated and inaccurate. So, no — the movie was not a faithful rendition of Asimov's writings. It couldn't be, because it had to fix the parts he got wrong. Regardless of what the movie didn't do that Asimov's books did, what it did do was tell a smart, exciting story with interesting characters and a beautifully designed robot who seems very real and very "human". Of the Asimov robot stories I read, they seemed to involve dilemmas arising from unforeseen conflicts among his Three Laws of Robotics. Right. And that was the very thing the movie was all about. I'm sure that was your point, Wayne. IMDB has 50 trivia items for this movie. Here’s a few of the ones I found the most interesting, in the blue text. 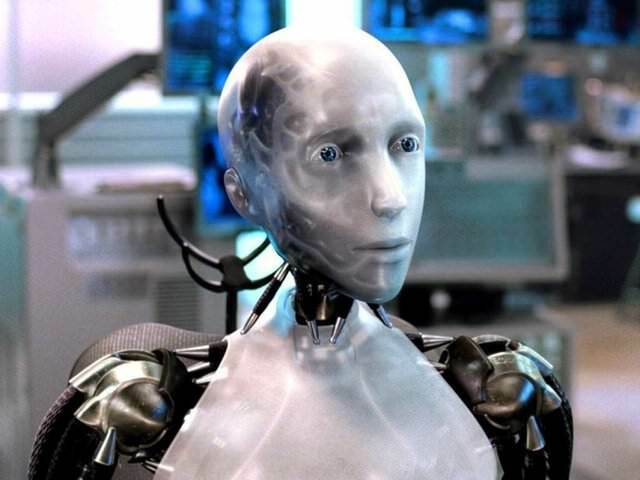 For the character of Sonny the accused robot, the effects team used the same process that was used to create Gollum in the Lord of the Rings trilogy, with Alan Tudyk providing the body movements and voice for Sonny. Note from me: The fact that Alan Tudyk did both the voice and body movements for Sonny somehow makes the performance even more appealing than if it had been done by two or more people. During an interview on American Chopper: The Series (2003), Will Smith told how he wrecked the motorcycle at around sixty miles per hour, during the filming of the scene at the robot storage facility (you can see him begin to lose control in the film). Note from me: I can just imagine the entire film crew frozen in shocked silence for several seconds when Will went down . . . and then l screaming like girls as they rush forward to find out if (a) Will was injured, and (b) they were all out a job. The motorcycle that Will Smith's character rides in the movie is a 2004 MV Agusta F4-SPR. It is one of only 300 produced worldwide. Its 750cc, inline 4-cylinder engine produces 147 horsepower and can propel the bike in excess of 175 mph. Note from me: Only 300 made. One wrecked by Smith. 299 left. Will Smith hired Orange County Choppers of TLC's American Chopper: The Series (2003) to build an "I, Robot" themed chopper that was unveiled at the premiere of the movie. Note from me: Only one made. Don't let Smith ride it! The outside design of the top floor executive suite of U.S. Robotics CEO Lawrence Robertson's unique shape is a nod to the first really functional robot built by Metro-Goldwyn-Mayer for the movie Forbidden Planet in 1956. The shape of the top of the building is the same shape of the top of the main body of Robby the Robot. This is the part that used to blink when Robby spoke. Note from me: I tried to find a jpg of the building to see if this was true, but I struck out. Alex Proyas insists that even Will Smith did not want to be funny in this film, despite pressure from the studio. The humor was designed in such a way that it could easily be edited out. Unfortunately an early test screening in California attained the highest score in the history of the studio, and the movie's future was sealed: the jokes would stay in. Note from me: Hmmm. What jokes? I remember some cocky dialog that fits well with a "Will Smith" type character but . . . oh, okay. Those jokes. Heck, I liked them, too. The Borscht Belt humor in the film, such as "You must know my ex-wife," and "You thought I was callin' you sugar? You ain't that rich" was the contribution of Akiva Goldsman. Note from me: Ah-ha. That was not much of a joke, I agree. When Will Smith walked into his first I, Robot meeting, the first thing he said was, "I have to save the world in every movie I make." Everyone present who cherished the complexity of the script felt their hearts sink in their chest.... At the movie's premiere, when the lights came up, Will Smith's little son turned to him and said, "Dad, you gotta stop saving the world in every movie you make!" Note from me: Kids. They never appreciate the sacrifice's old Dad makes. A number of critics and Asimov fans continue to dismiss I, Robot as a film that has nothing to do with the book, claiming "they should have followed the novel." Many do not seem to realize that the book is not a novel at all, but a series of loosely-connected little logic puzzles. As the years pass and the movie continues to be enjoyed, however, more and more real-world roboticists have come forward to say that they were inspired by the Will Smith film to achieve real advancements in robotics, and others have written papers on how the movie actually does hold true to Asimov's concepts, and perceptively explores the nature of the Three Laws. Note from me: This goes along with what I posted earlier about the difficulties of doing an "accurate" movie version based on Asimov's collection of short stories. The idea of a robot hiding in a large group of identical robots comes from the Isaac Asimov story "Little Lost Robot", which appeared in the original book. Sonny's dreams in which slave robots are liberated comes from the Asimov short story "Robot Dreams", a sequel to the book. Note from me: So, some of Asimov's concepts do make their way into the movie. That's gratifying. Denzel Washington was offered the role of Spooner. Had he accepted, this would have been the second time he played a previously-married police officer with a bionic left arm who chases down a killer robot, the first being Parker Barnes in Virtuosity (1995). Note from me: Denzel's casting would have dramatially changed the movie. He wouldn't have caused the kind of "save the world" rewrites which Will did, and his acting style does NOT lend itself to cocky wisecracks. 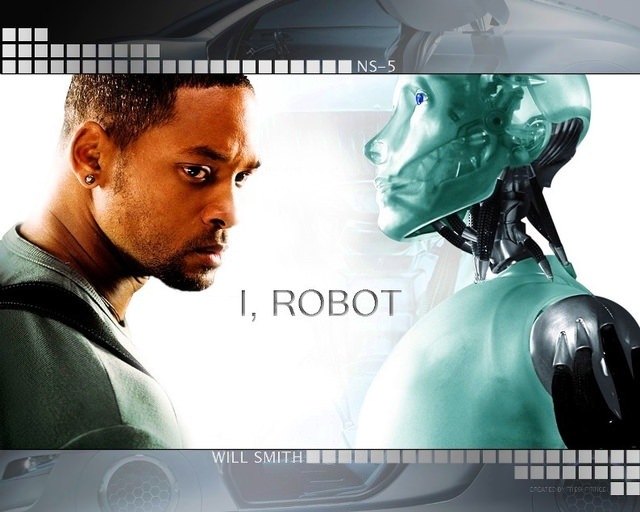 One of the best things about the story was the way Will Smith's character was so conflicted on the subject of robots. He resented them because he felt they lacked the ability to make choices which were NOT based on pure logic, but then he ends up having to prove that robot committed a murder for complex reasons which involved emotions and personal loyalty. And just to sweeten the plot, Smith's character was part robot himself!